DETROIT (Bloomberg) -- Fiat is spinning off Ferrari later this year, losing its top luxury brand. CEO Sergio Marchionne badly needs Maserati to fill the vacuum. Ferrari’s power, prestige and profits have helped bankroll Dodges, Jeeps, Fiats and Chryslers that account for most of Fiat Chrysler Automobiles’ revenue. Betting that Maserati can play a similar role, Marchionne is adding an SUV and coupe to the model lineup and opening plush U.S. dealerships from Westport, Conn., to San Jose, Calif.
Maserati’s reputation for performance is well established, and luxury autos are selling briskly in the U.S. But that segment of the market is crowded and aggressively contested by Mercedes-Benz, BMW, Audi and Lexus. For Marchionne to succeed, wealthy Americans will have to see Maserati’s $69,800 entry- level Ghibli sedan as a viable alternative to the BMW 5 series or Mercedes E class. And while Maserati more than doubled global shipments to 36,448 in 2014, the brand has since stumbled. Through April, vehicle sales fell 9 percent to 7,306. First-quarter profit sank 39 percent to $40 million, a decline Fiat attributed to a slowdown in China. The Ghibli, introduced in 2013, sold well at first in the U.S. but in recent months dealers have been ladling out incentives. In May, discounts rose to $9,602 a vehicle, almost triple the level in February, according to Autodata Corp. The challenge for Maserati is finding a way to broaden its appeal without chipping away at the exclusivity that lets it charge as much as $210,000 for a convertible Quattroporte. The 101-year-old brand started out making spark plugs for planes. The first car to bear the Maserati name was built in 1926 and immediately began winning races. In 1929, a Maserati set a world speed record -- 153 mph -- the first of many to come. 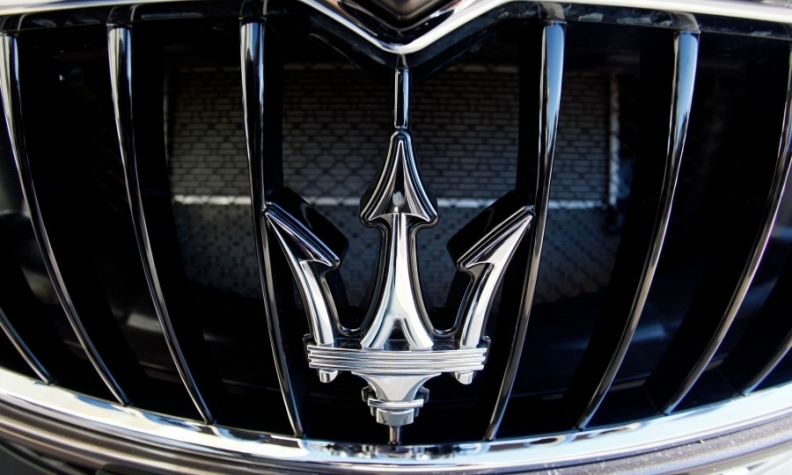 The brand’s trident badge is a facsimile of the three-pronged spear brandished by a statue of the god Neptune in Bologna, Italy, Maserati’s original hometown. Over the decades, Maserati built a reputation as a less flashy cousin to Ferrari, which plans an initial public offering. Ferrari picked UBS Group AG to manage the IPO in New York later this year, people with knowledge of the matter said. Maserati’s cars were sleek and stylish and consumed the quarter-mile at a blistering pace. The relative scarcity of the product only enhanced the brand’s exclusivity; global sales didn’t crack 10,000 until 2013. These were cars driven by rock stars. In 1978, Joe Walsh paid homage in the classic song “Life’s Been Good,” in which he sings: “My Maserati does 185. I lost my license. Now I don’t drive.” More recently, the Hollywood arrivistes of HBO’s “Entourage” burned up the Los Angeles freeways in Maseratis. Fiat bought the company in 1993, and in the past five years Marchionne has helped restore its performance and luster. Maserati doesn’t command Ferrari’s 13 percent margins, but its 10 percent showing is triple that of Fiat Chrysler’s margin overall. Marchionne sees the brand as the linchpin of his 48 billion euro ($52 billion) plan to turn Maserati, Alfa Romeo and Jeep into global brands and boost net income fivefold. Marchionne has pledged to boost Maserati margins to 15 percent and almost double global sales to 75,000 by 2018 -- a tall order, analysts say. IHS Automotive forecasts Maserati registrations of about 54,000 by then. Expanding the number of U.S. dealers from 104 to 125 by the end of the year will help. So will adding the Levante SUV, by all accounts an impressive model. Effective marketing could introduce the brand to drivers who otherwise would just buy German. Already, there’s anecdotal evidence that the Ghibli is starting to attract younger buyers.